East Texas Bapist University Marshall Texas. When I was about fourteen years of age, I accompanied cousins Warren and Earl Carlton Russell to Marshall, Texas, to fetch home their sister, Eleanor Lois, from East Texas Baptist College for the summer. Each time I walked up her women's dormitory hall, Eleanor proceeded me bellowing, "Man on the floor, man on the floor" to alert sister dorm residents of whatever danger I represent. Eleanor's bellowing flattered as much as it embarrassed, and represented my introduction to what we now call "faith-based" education. 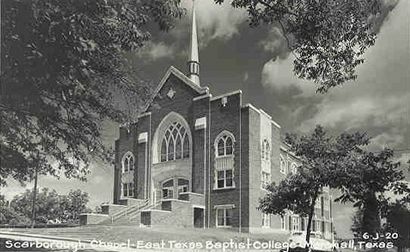 East Texas Baptist College, now University, began and remains in Marshall, Texas. W.T. Tardy started the school as the College of Marshall in 1912, and the following year Thurman C. Gardner became the first president of the institution. The college, which offered a two-year program, was more of a "junior college" or prep college until 1944, when a four-year curriculum began. By 1950, about the time Eleanor Lois traveled north from Burkeville, in Newton County, to register for classes, she joined about 650 other young scholars who were interested in training in a Christian atmosphere for a teaching career. By then, East Texas Baptist College operated in seven buildings situated on a 100-acre campus located just north of the downtown business area of Marshall. ETBC expanded its offerings to the liberal arts, won accreditation from the Southern Association of Colleges and Secondary Schools, and in 1984 the Texas Baptist General Convention renamed the institution a university. Over the years the East Texas Historical Association has enjoyed the support and fellowship of many ETBU administrators and teachers, including Charter Member and now Past President Seth Walton, former ETBU President Jerry Dawson, and former ETBU Vice President and ETHA Past President Gwen Morris. Dr. Linda Hudson�once my graduate assistant�taught at ETBU until her retirement, and scholar/teachers Jerry Hopkins and Jerry Summers do so yet As East Texas Baptist University approaches its centennial within a lustrum�view the movie "ROOSTER COGBURN" or look the word up in the dictionary�officials and graduates can be proud of their long and competent service. And that once a "man on the floor" wondered what all the fuss was about.